On Saturday, February 2nd, the TSA Region 8 Conference was held at Northern Cambria Middle School. There were 563 students and advisors plus another 98 judges present totaling 661 in attendance. Region 8 is the largest region in the state with the most schools attending. Region 8 has the most middle school chapters in the state of Pennsylvania with 12. The NCSD chapter had 30 students compete, with 19 of them placing in the top 3. These students now have the opportunity to travel to the PA TSA State Competition at Seven Springs in April. 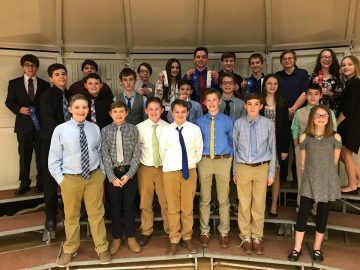 Categories that NCMS students in grades 5 through 8 placed in top 3: Mechanical Engineering (Rude Goldberg Machine) 1st, 2nd and 3rd; Video Game Design – 1st; Junior Solar Sprint (Gear power car) – 2nd and 3rd; System Control Technology (Lego Mindstorms) – 3rd; and CAD Foundations – 3rd. Categories that NCHS students in grades 9 through 12 placed in top 3: Children’s Stories– 1st; Computer Aided Design 3D Engineering (CADD) – 3rd; Dragster Design – 2nd & 3rd; Flight Endurance – 1st; Forensic Science – 2nd; Structural Design & Engineering – 2nd & 3rd; System Control Technology – 2nd; Technology Problem solving – 2nd & 3rd; Video Game Design – 2nd.